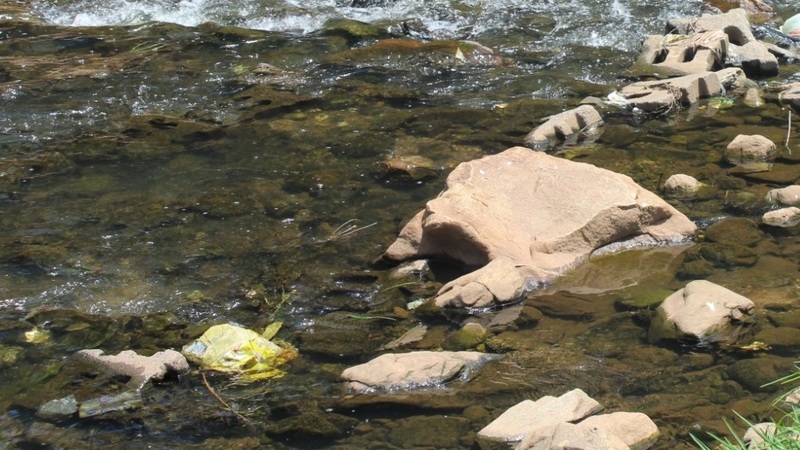 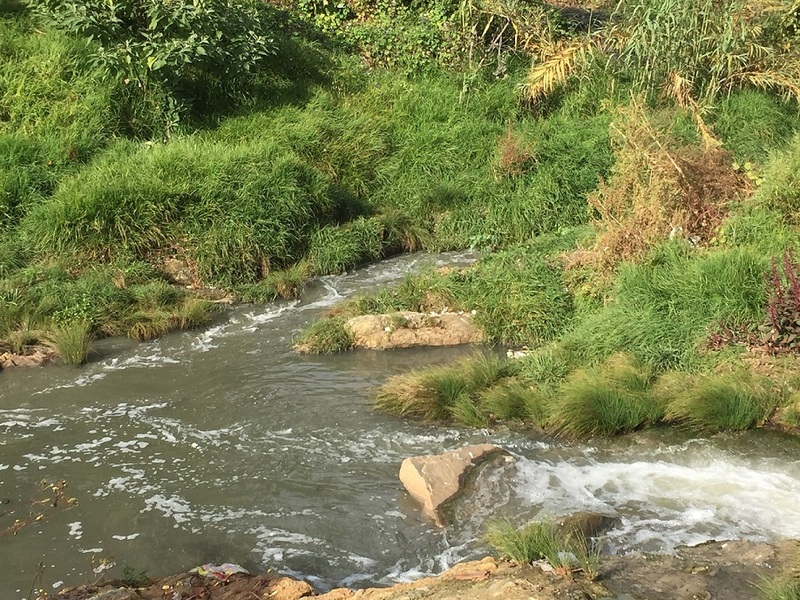 Jukskei River recovery from a major sewage spill is described. 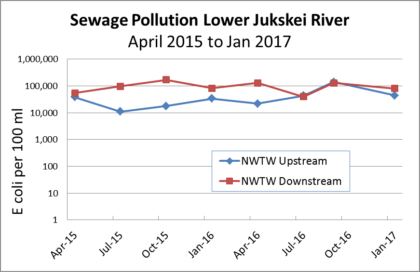 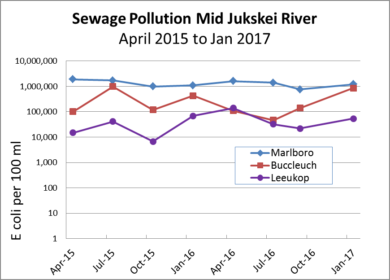 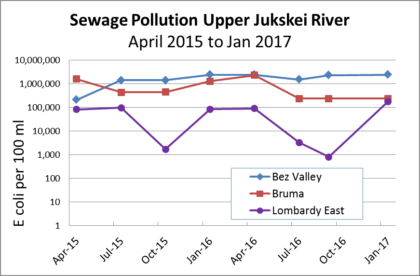 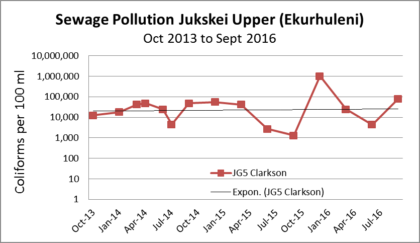 In April 2017 a large sewage spill in Bruma caused a pollution increase in the upper Jukskei River. 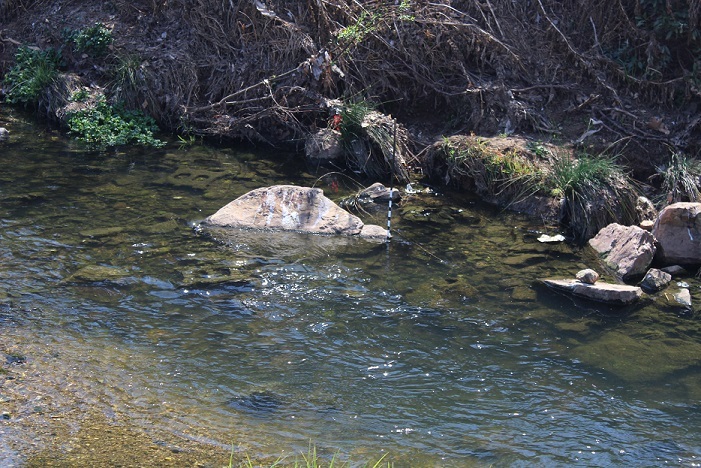 The flow was fixed on 3 May. 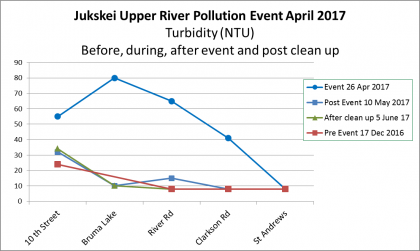 On 12 May there was heavy rain in the catchment (40 mm measured in Kensington), and on 15 May a contractor began cleaning up this section of the river. 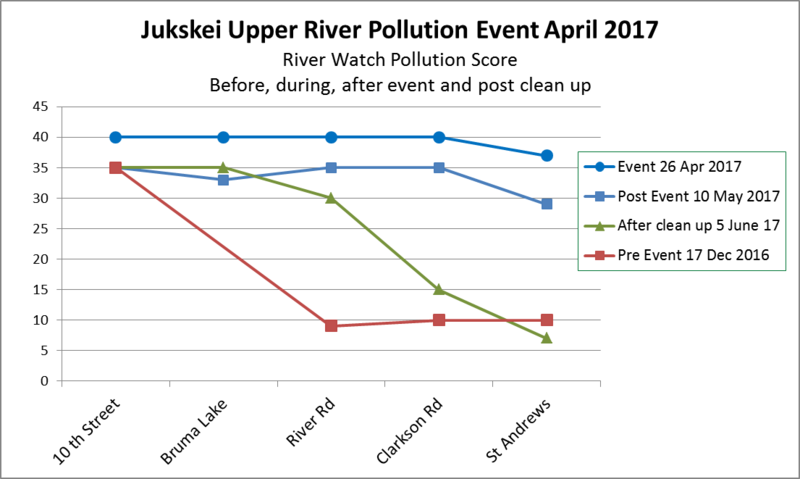 I assessed the condition of the river during the spill (26 April), after the event (10 May) and after the clean-up (5 June). 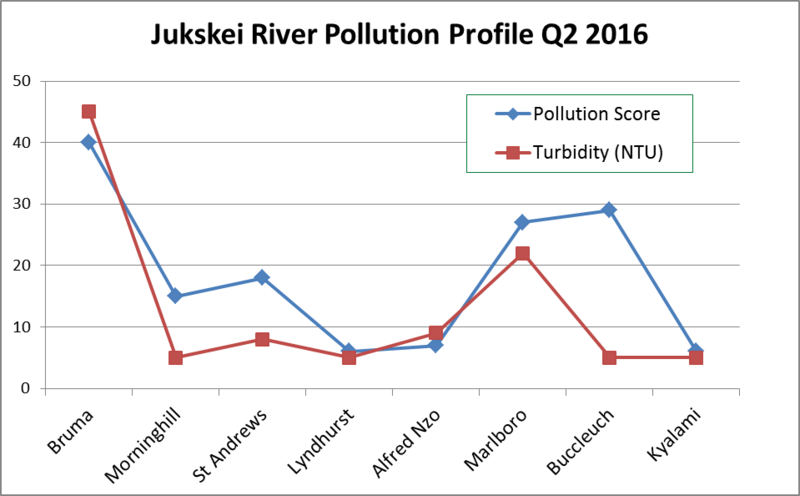 These results were compared to the most recent previous assessment (17 Dec 2016). 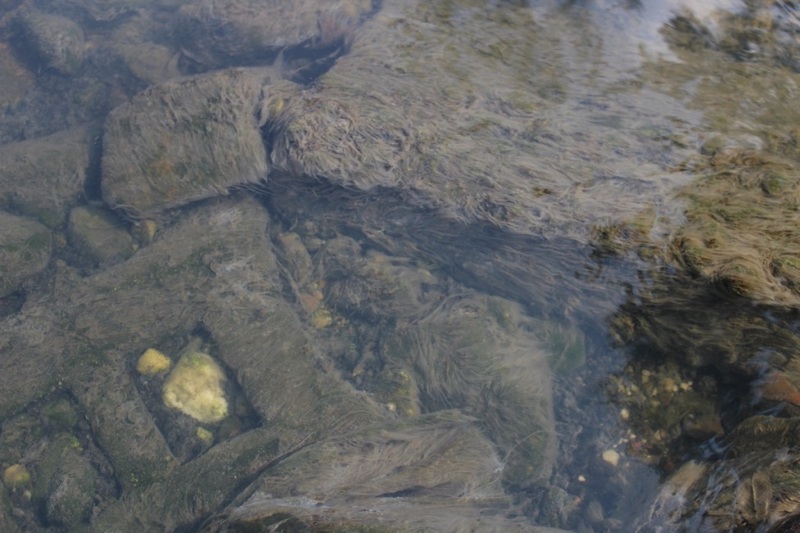 A river health test using macro invertebrate MiniSASS assessment requires about six weeks to recover and will be done in July. 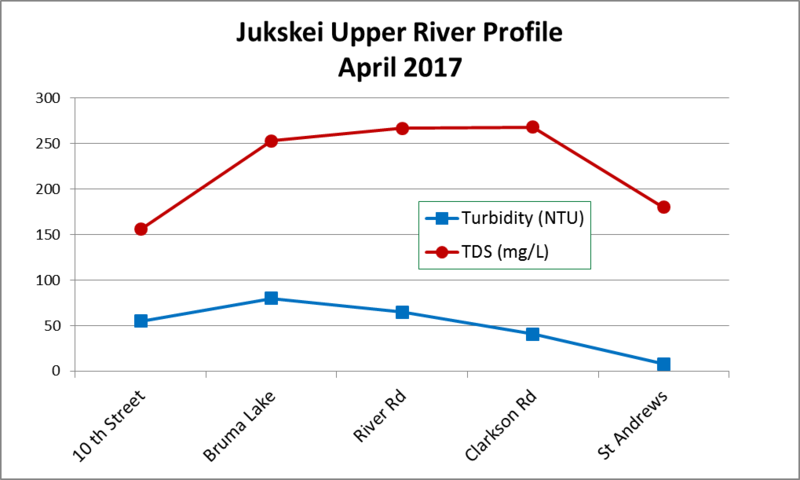 Direct measures of water quality (Turbidity and TDS) showed a rapid return to pre event levels once the spill stopped flowing. 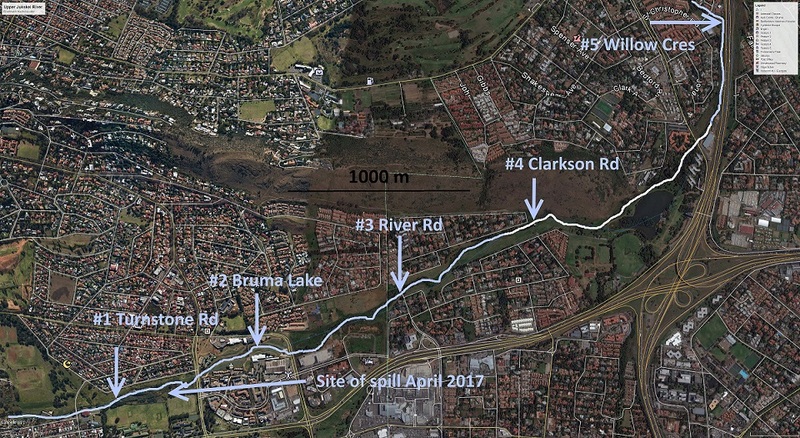 The general consequences of the spill (appearance, colour, turbidity, foaming and smell) had not returned to levels before the spill by the post clean up assessment on 5 June. 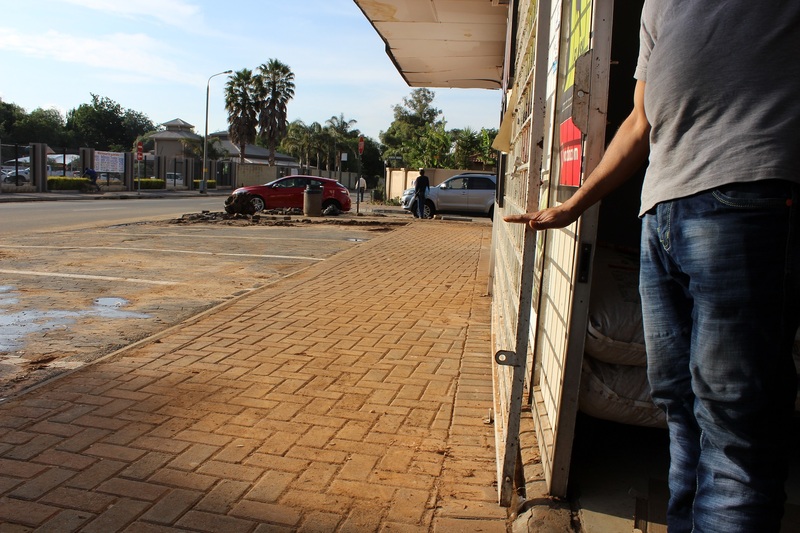 Residents of Morninghill have expressed satisfaction with the clean-up which eliminated the smell. 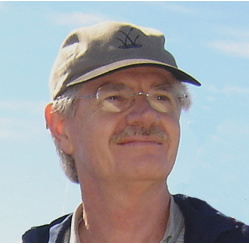 It is not possible to draw conclusions as the efficacy of treating the contaminated river with special solutions of bacteria and enzymes since there are many uncontrolled variables. 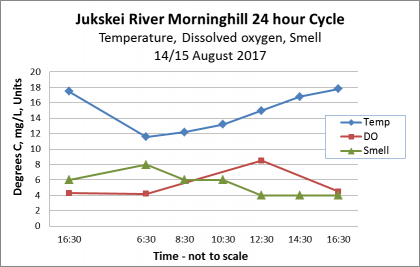 Only the elimination of smell in Morninghill is an improvement on the pre-condition of the river. 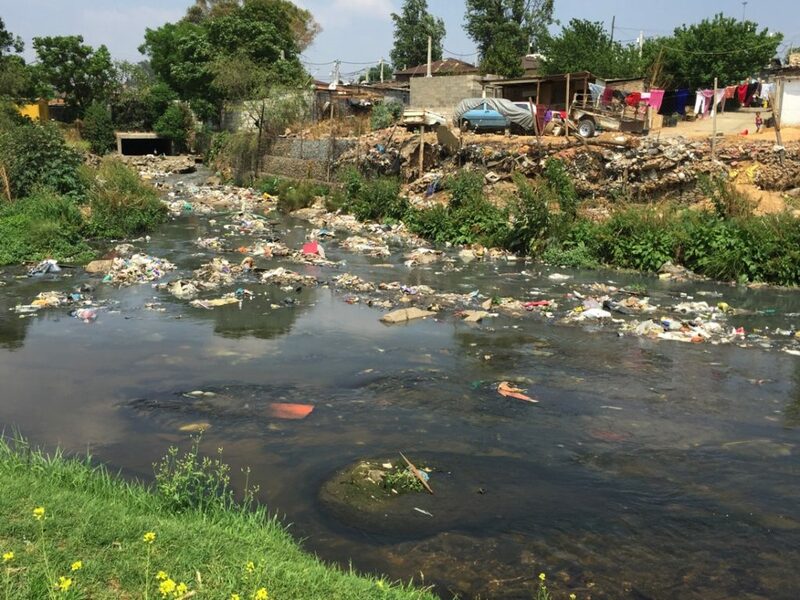 The real problem is the constant flow of pollution from the Johannesburg CBD, and the state of the river will be dire until the bad buildings there are fixed. 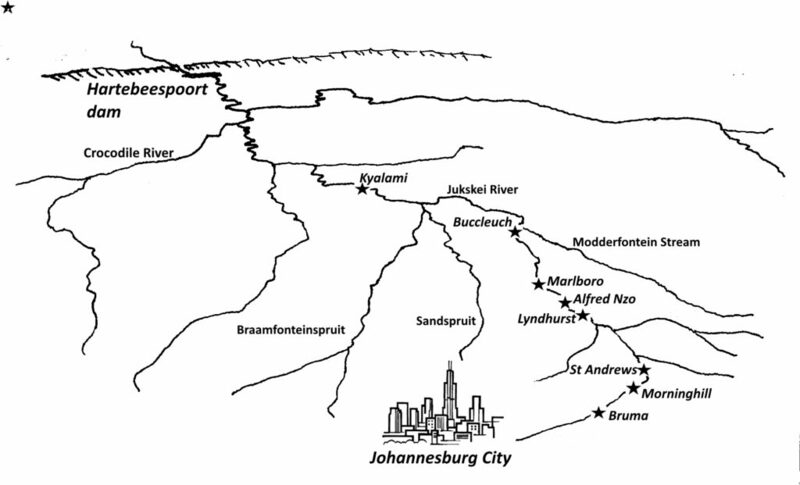 The map shows the five monitoring sites used to monitor the impact and recovery from the spill. 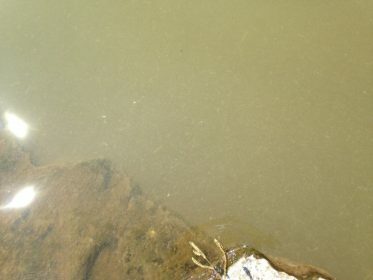 The first site is upstream of the spill and the others downstream. 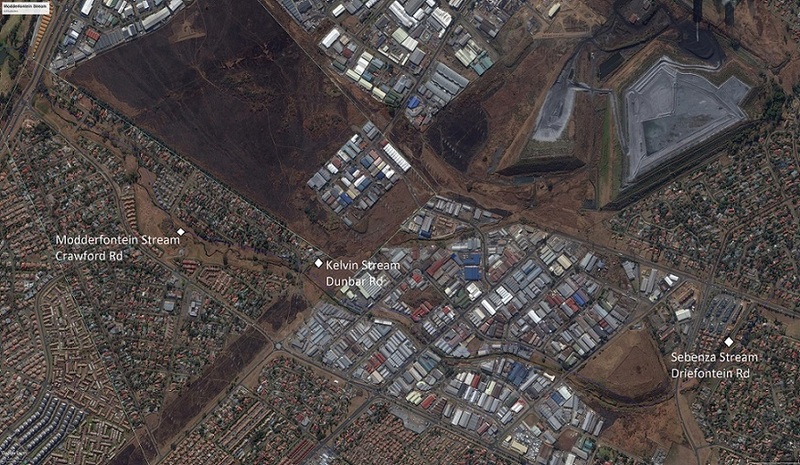 Turnstone and Bruma sites are in Johannesburg and River Rd, Clarkson Rd and Willow Crescent are in Ekurhuleni. 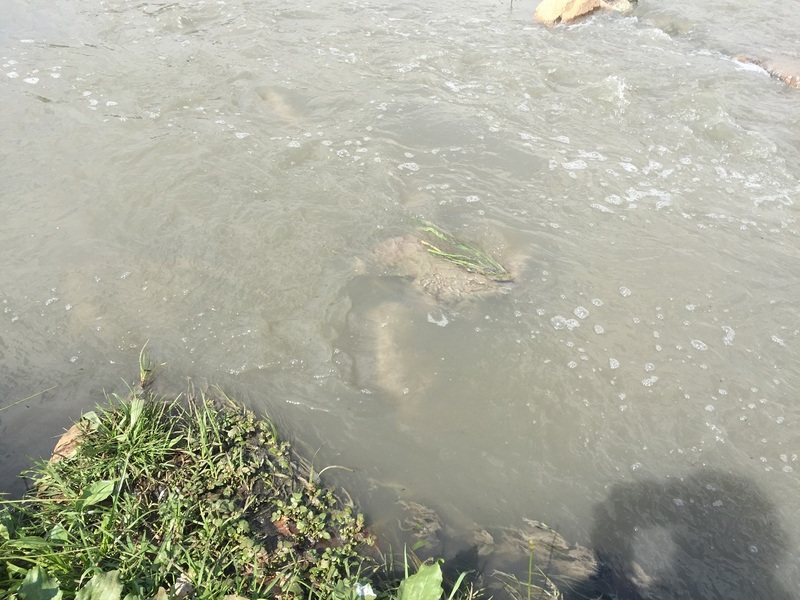 The problems brought about by the sewage spill in Bruma started in the second week of April with residents in Morninghill questioning the increased smell in WhatsApp groups, later on Facebook. 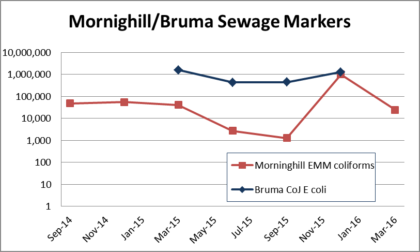 There was confusion how to report it (Morninghill is in Ekurhuleni and Bruma is in Johannesburg). The local Councillor made the first formal complaint on 23 April. Response teams fixed two other sewage leaks without finding the main spill in the Queens Wetland, which was only stopped on 3 May. 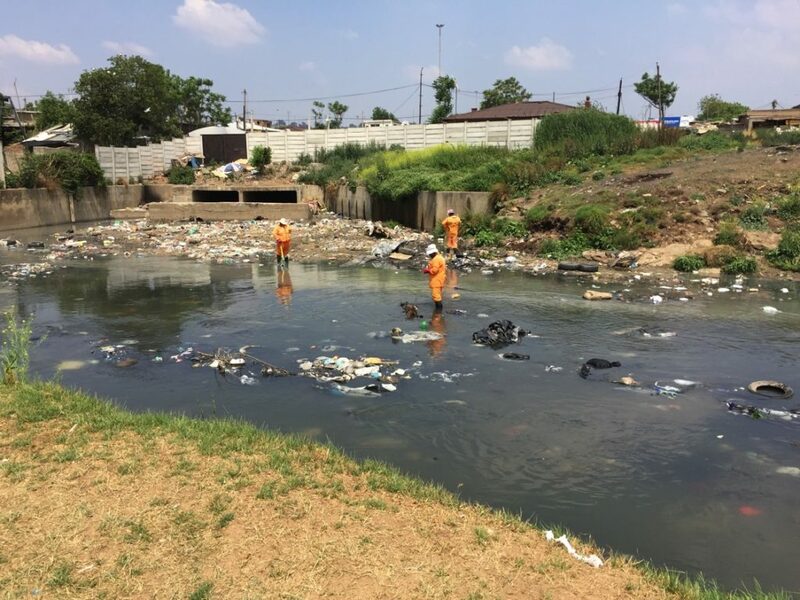 By this time the accumulated impact was so great that Joburg Water appointed a contractor to clean up, starting 12 May. 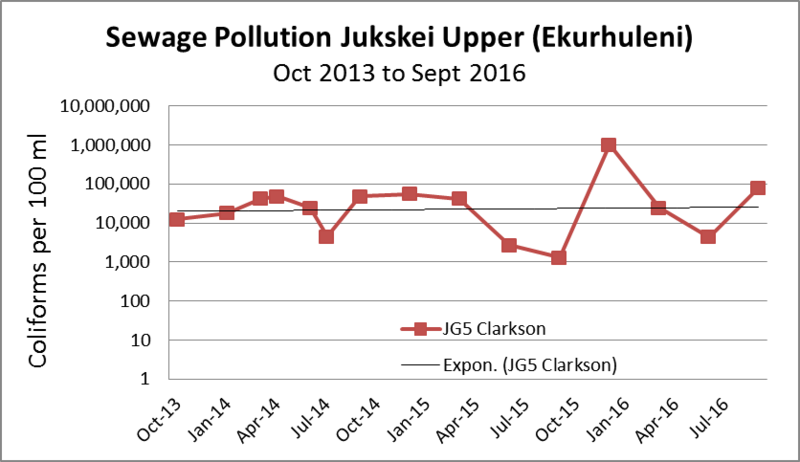 Since I had already assessed pollution before, during and after the spill, I carried out a further assessment on 5 June to give a more complete view of the recovery. 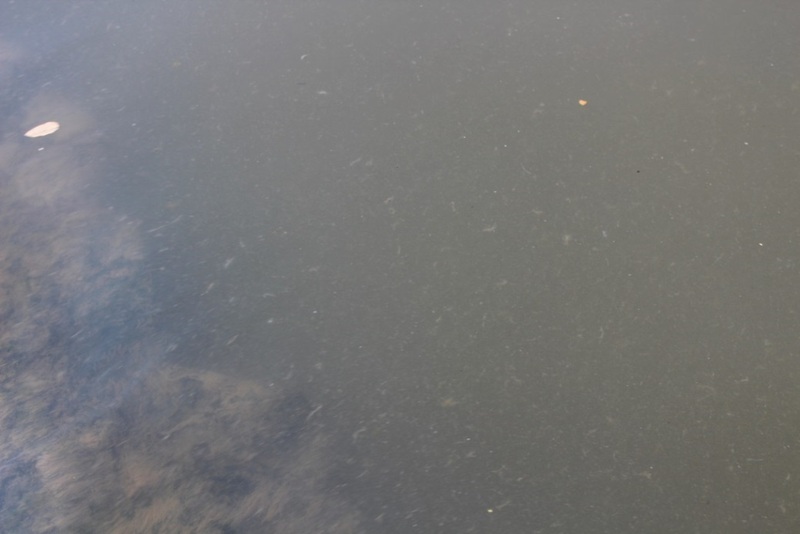 This river is extremely polluted permanently, so the April spill was in addition to the pollution from the Johannesburg CBD. Morninghill residents say the bad smell problem in their area started after the removal of Bruma Lake. 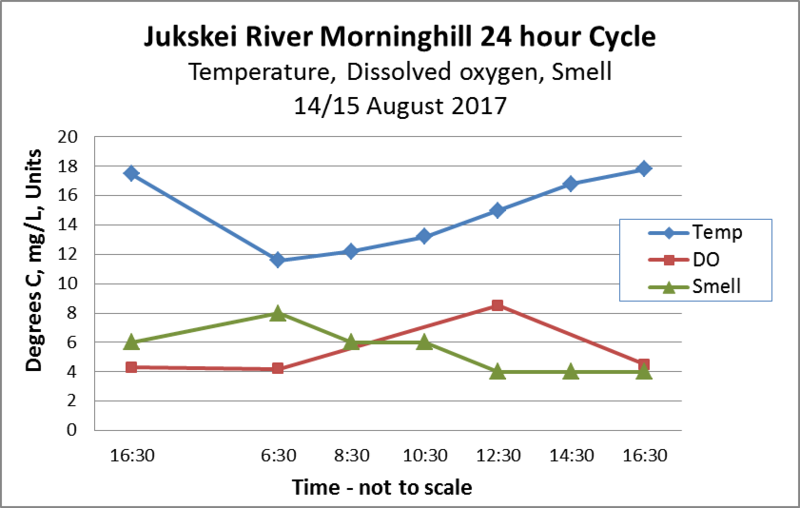 Odours are not easily measured and they tend to be stronger later in the day, possibly because the water warms up and expels dissolved gases. 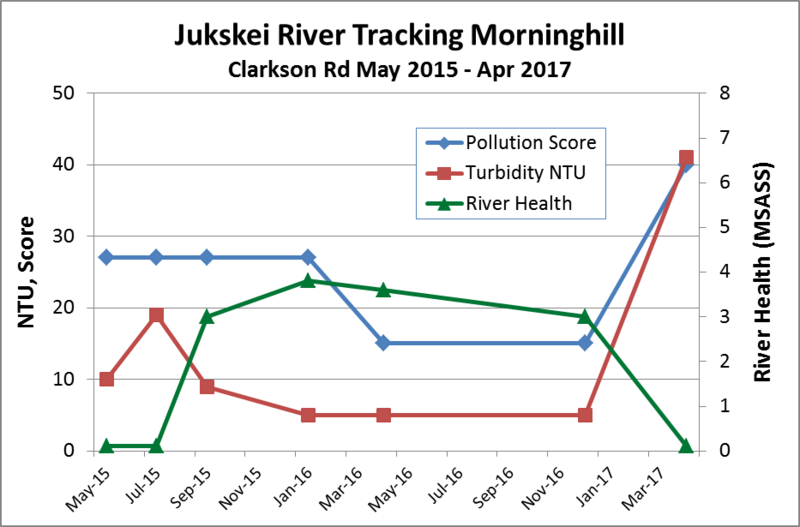 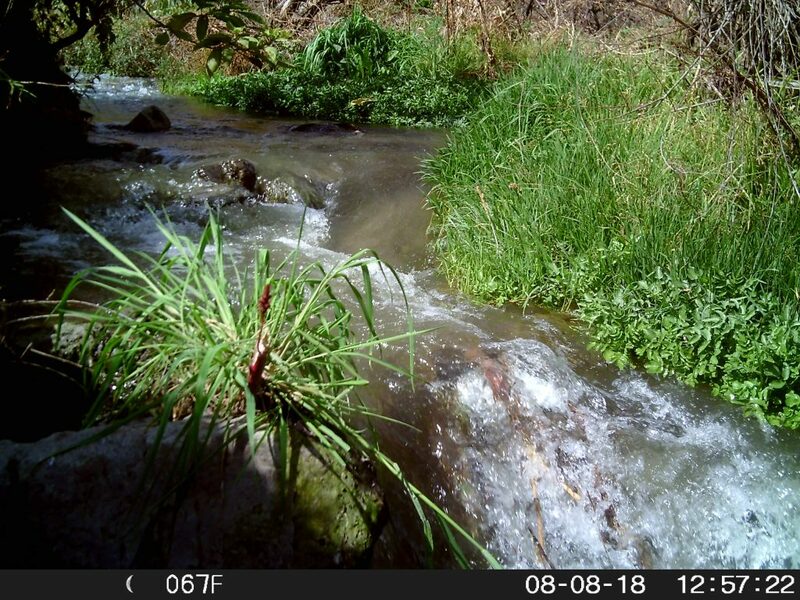 Pollution in the upper Jukskei River at Clarkson Rd, Morninghill, is tracked using the three measures of pollution: RiverWatch Pollution Score, Total Dissolved Solids (TDS as ppm) and Turbidity (NTU) shown in Figure 2. 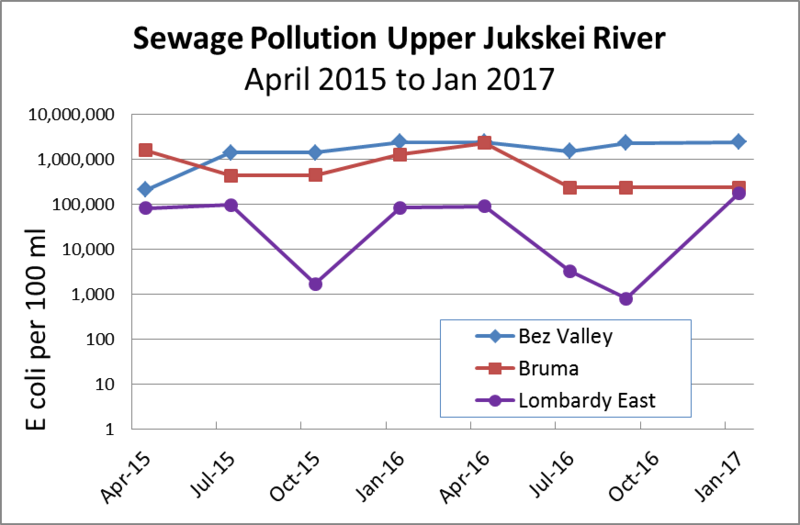 Pollution increased drastically during the sewage spill on 26 April 2017. 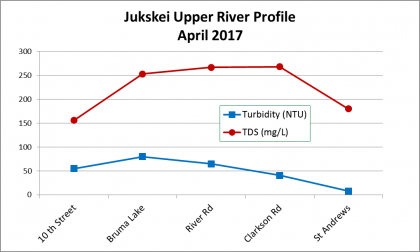 The main spill was stopped on 3 May, and on 10 May both turbidity and total dissolved solids were back at base level. 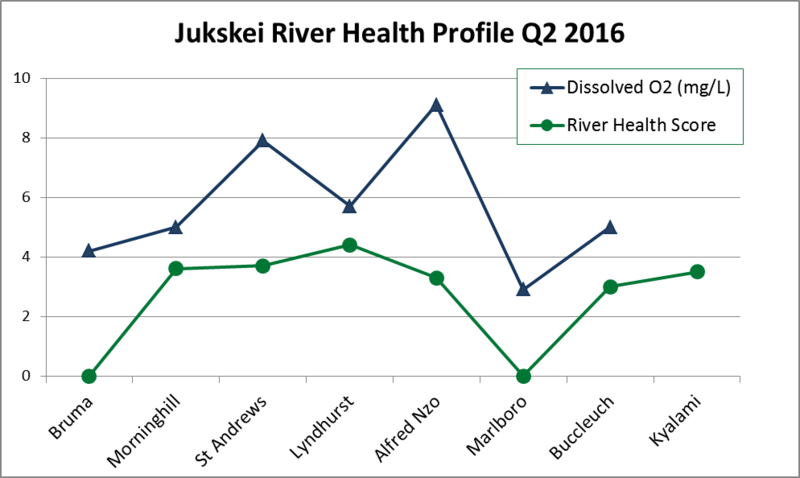 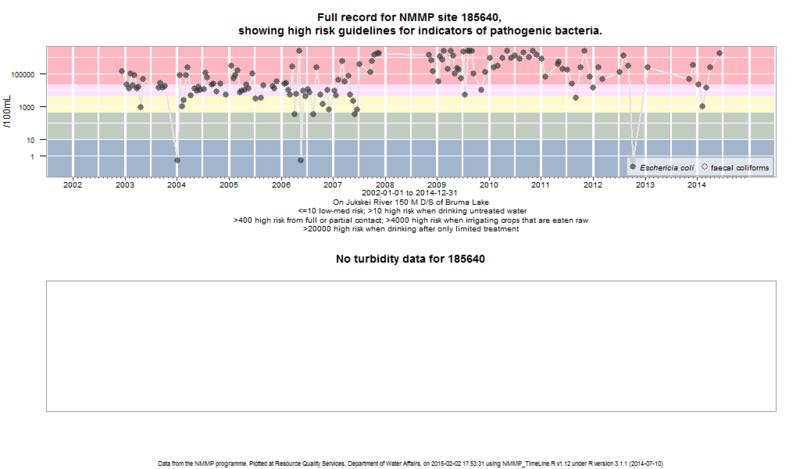 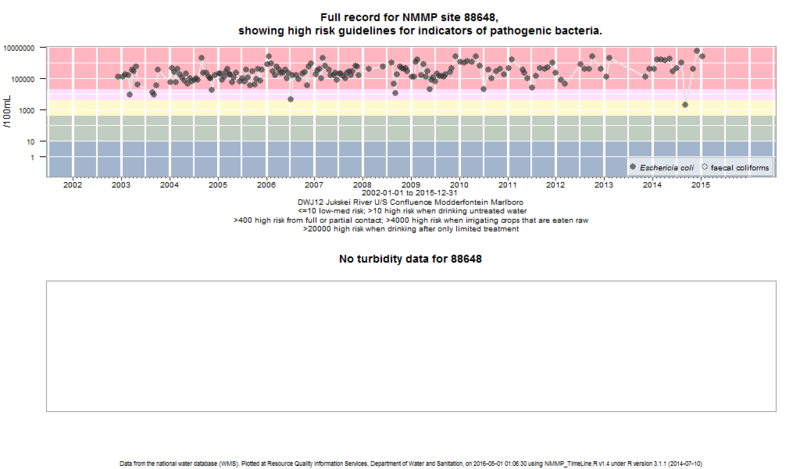 The condition of the river, measured as RiverWatch pollution score, took longer to decline mainly due to ongoing smell, appearance and foaming and was still not restored on 5 June. Figure 3 shows Turbidity (NTU) at five sites between Turnstone Street Weir and Willow Crescent in St Andrews, Bedfordview, before, during and after the sewage spill and after the clean-up. 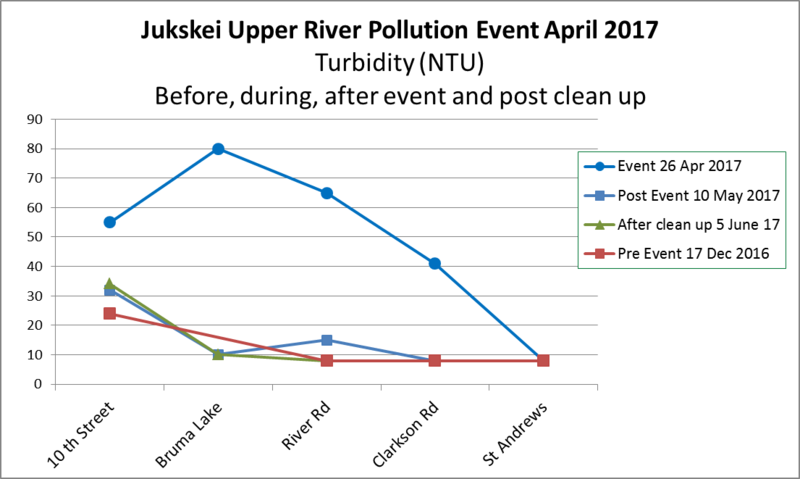 Turbidity returned to pre event levels directly after the spill stopped flowing. 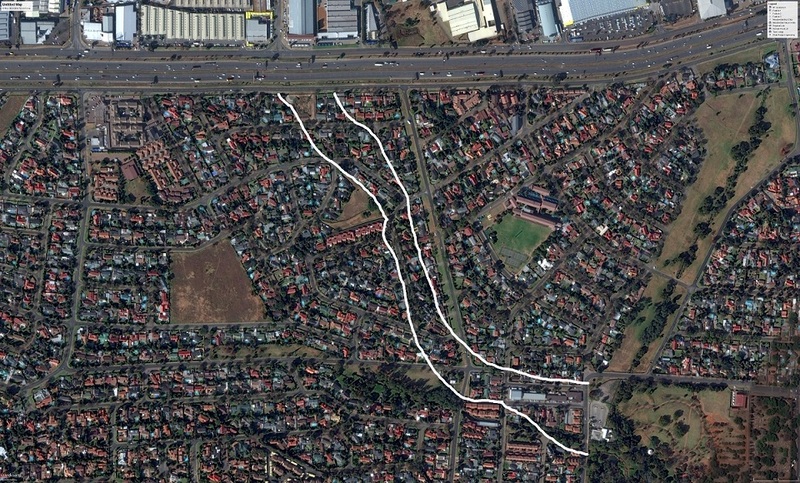 Figure 4 shows total dissolved solids (TDS in ppm or mg/L) at five sites between Turnstone Rd and Willow Crescent in St Andrews, Bedfordview, before, during and after the sewage spill and after the clean-up. 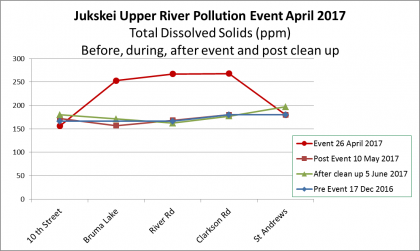 TDS returned to pre event levels directly after the spill stopped flowing. 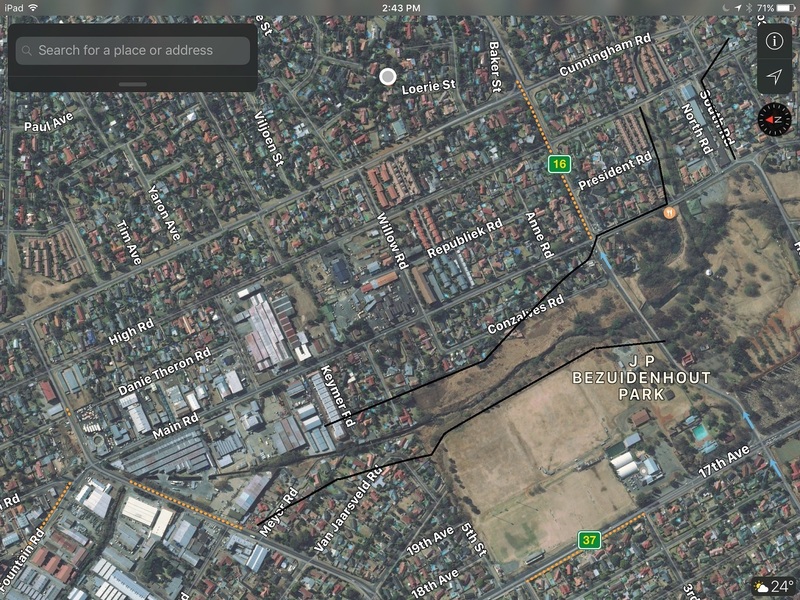 Figure 5 shows RiverWatch Pollution Score at five sites between Tenth Street Bruma and Willow Crescent in St Andrews, Bedfordview, before, during and after the sewage spill and after the clean-up. 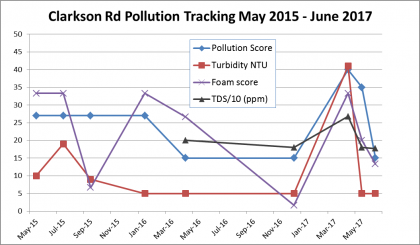 This score combines a visual assessment appearance, colour, turbidity, foaming and smell. 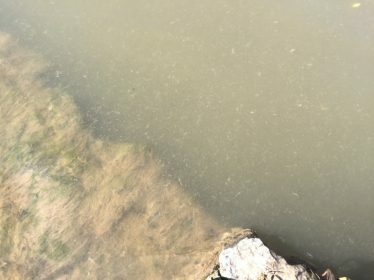 Some of these take longer to clear, such as foaming, smell and appearance. 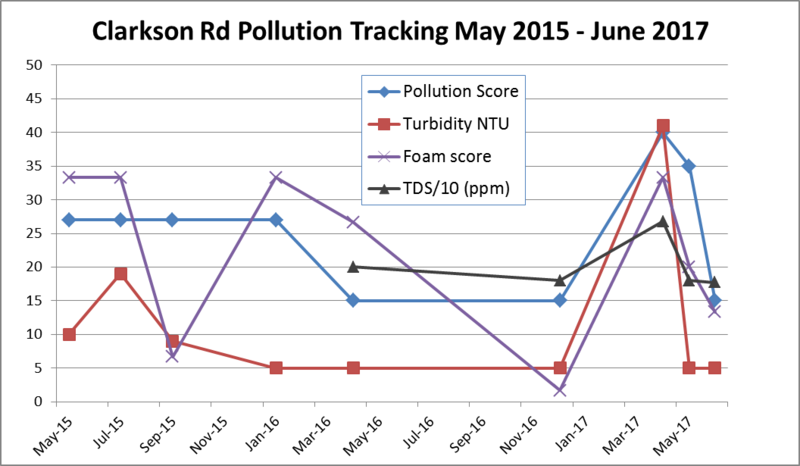 At the post clean-up monitoring on 5 June all the sites to Clarkson Rd in Morninghill had not fully returned to pre-event scores. 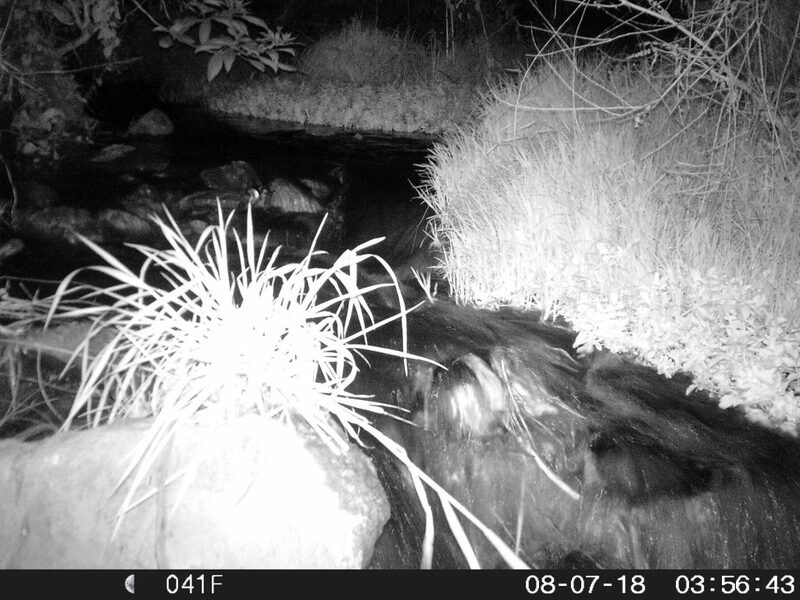 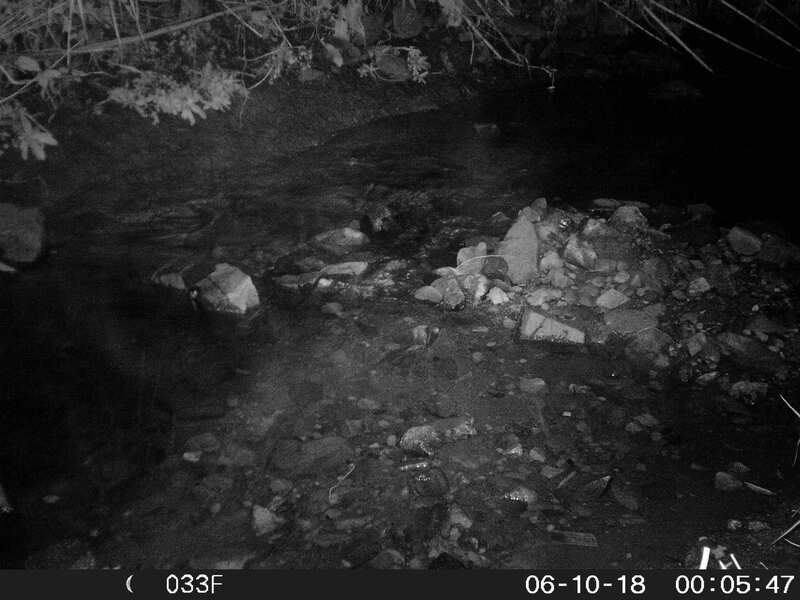 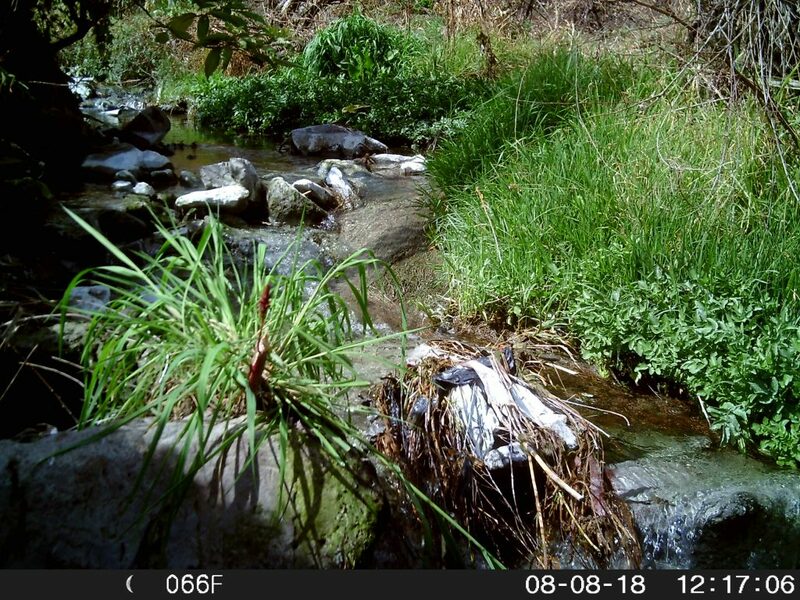 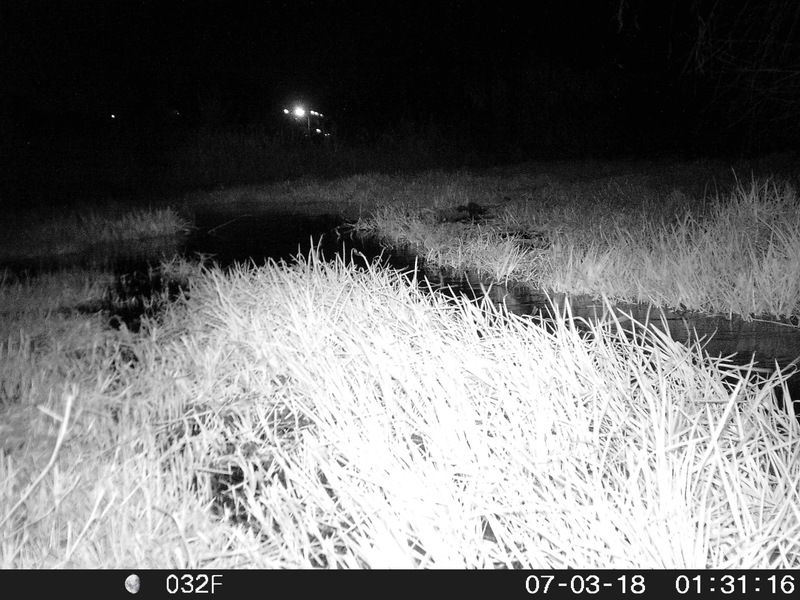 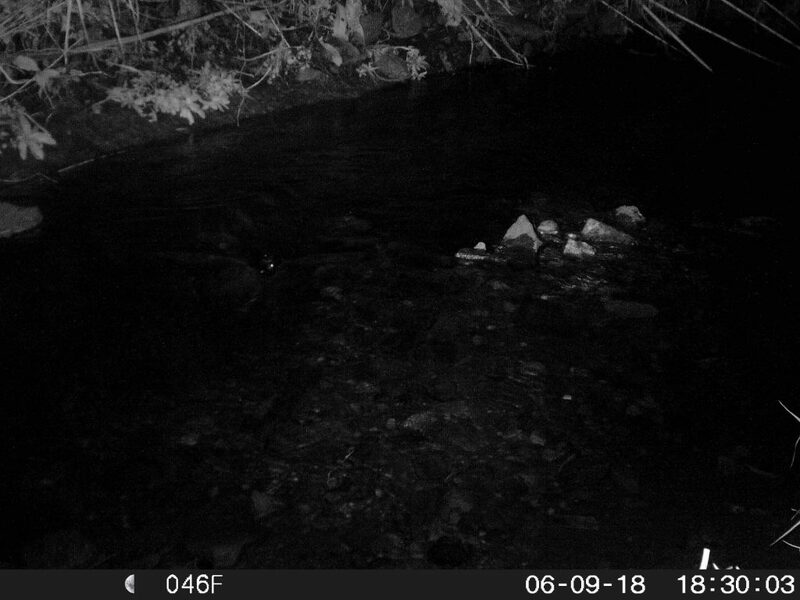 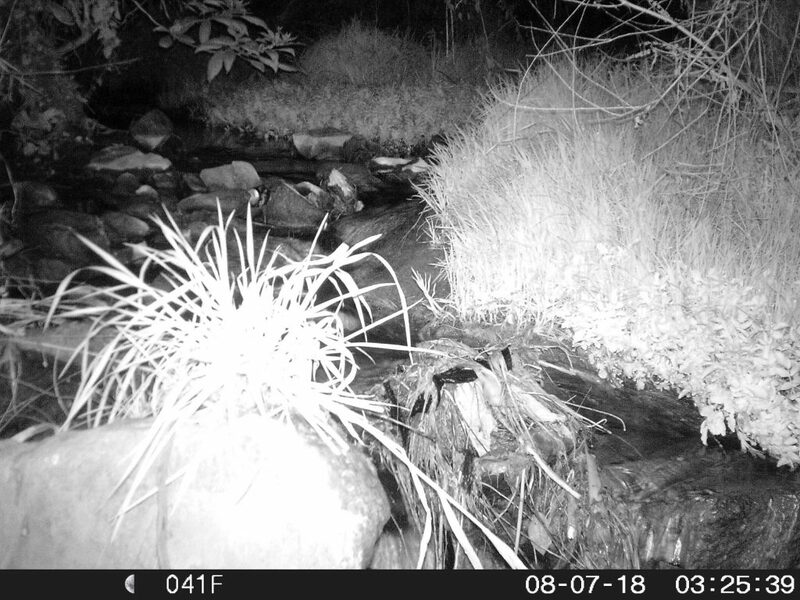 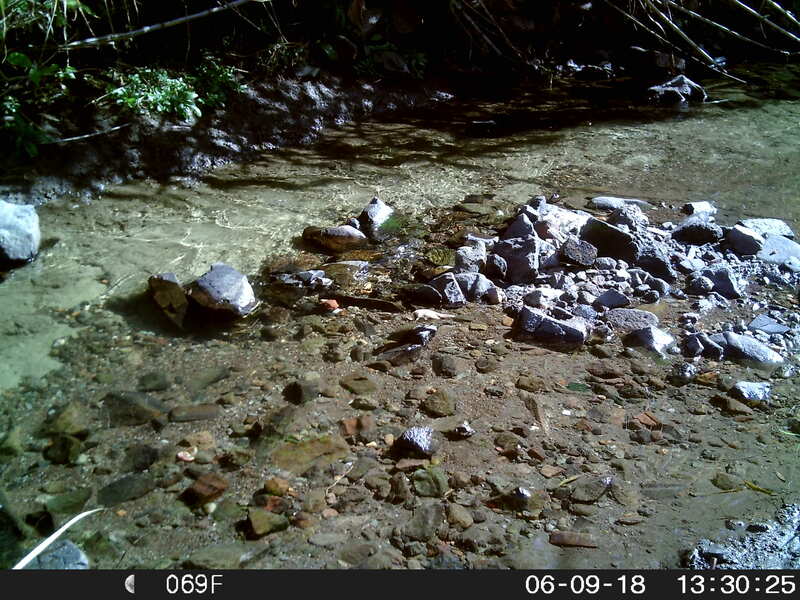 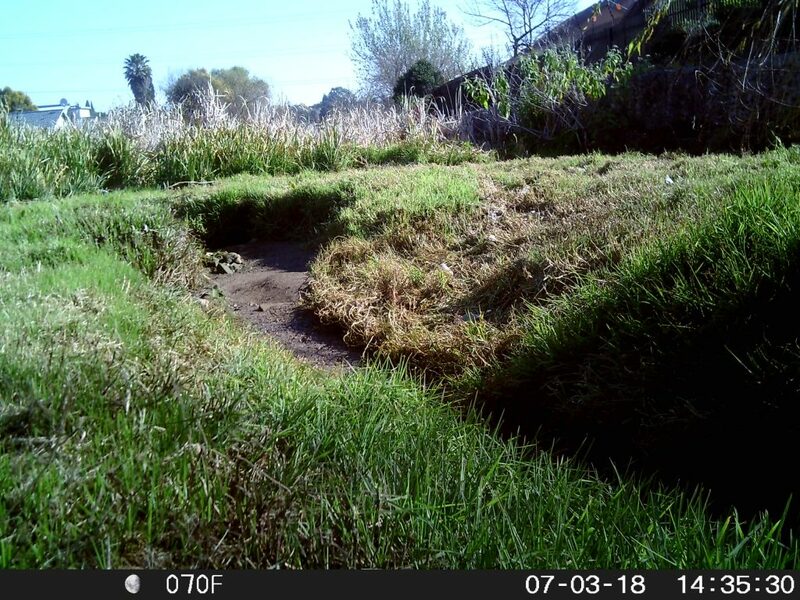 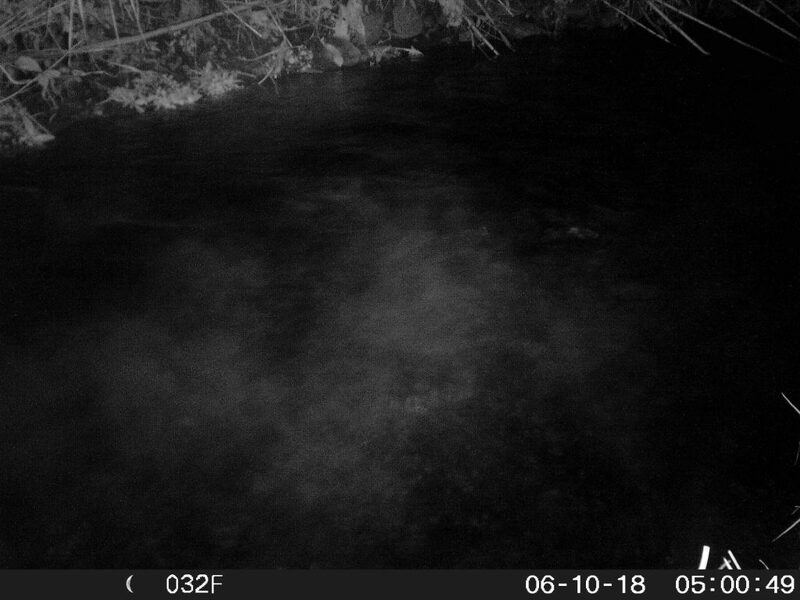 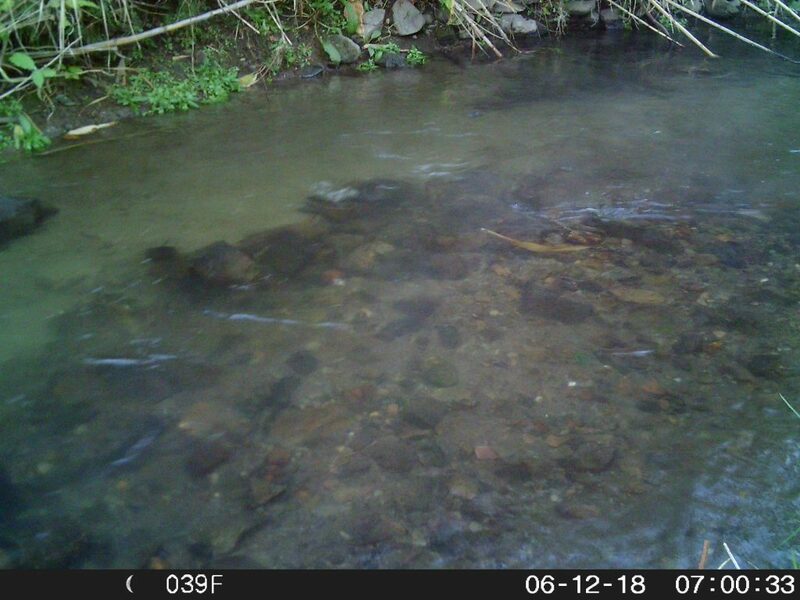 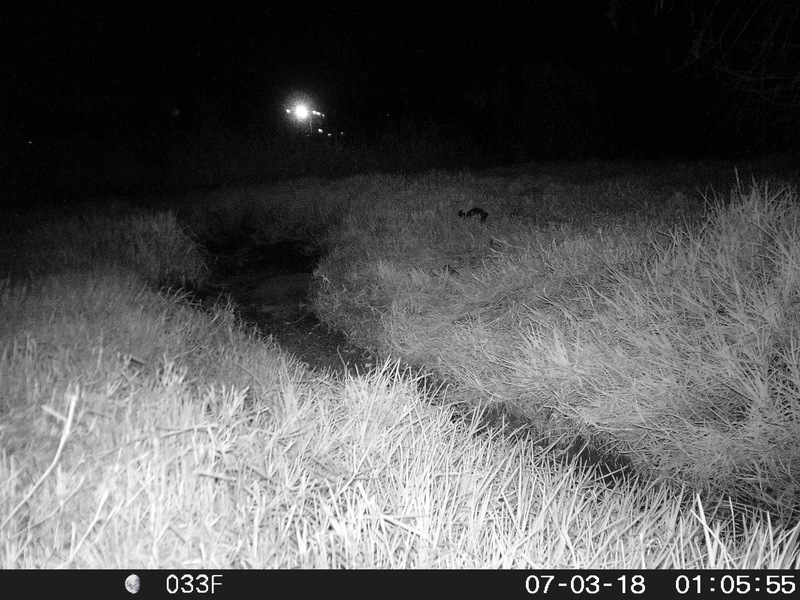 The photos that follow show the condition of the water and stream bed at the Turnstone Rd Weir (upstream from the major spill in the Queens Wetland) and a second site downstream from the Clarkson Rd Weir in Morninghill. 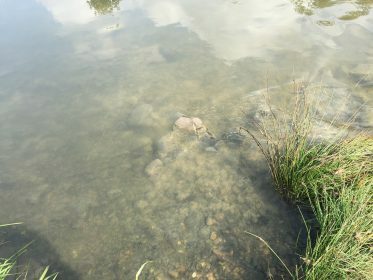 Click on the photo to see detail. 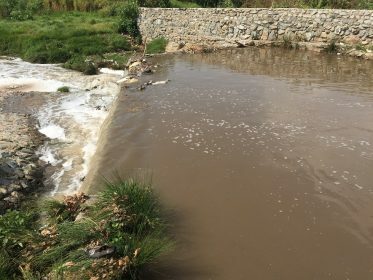 At Turnstone Rd Weir the situation appears much the same at all five occasions photographed between 17 December 2016 and 5 June 2017. 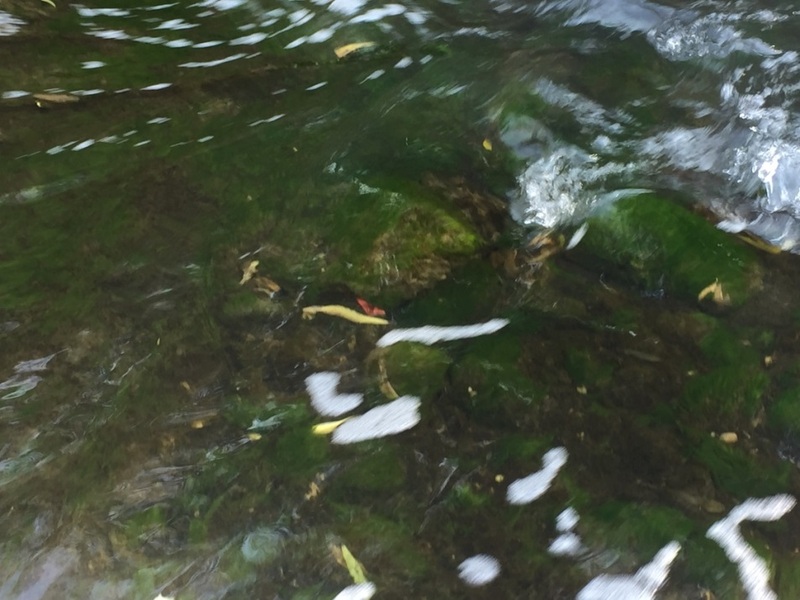 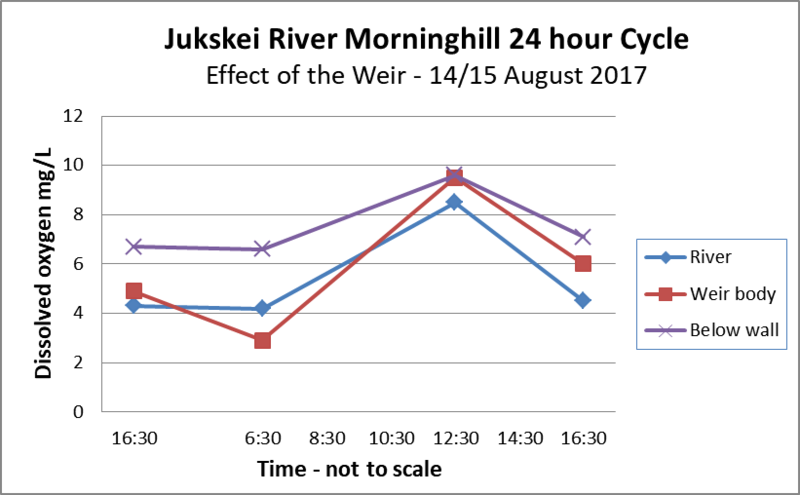 Conditions downstream from Clarkson Rd Weir improved by 10 May with some algae clear of sewage deposit, and on 5 June 2017 it was almost as clear as on 17 December 2016. 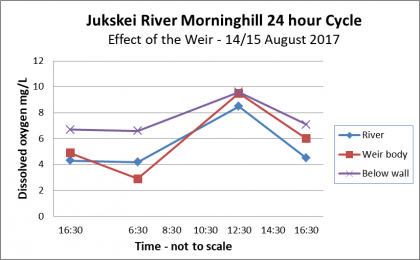 At Turnstone Rd Weir, the first site monitored and upstream from the April sewage spill, the condition of the river is unchanged on all the monitoring dates except during the spill (April 26) when it was worse. 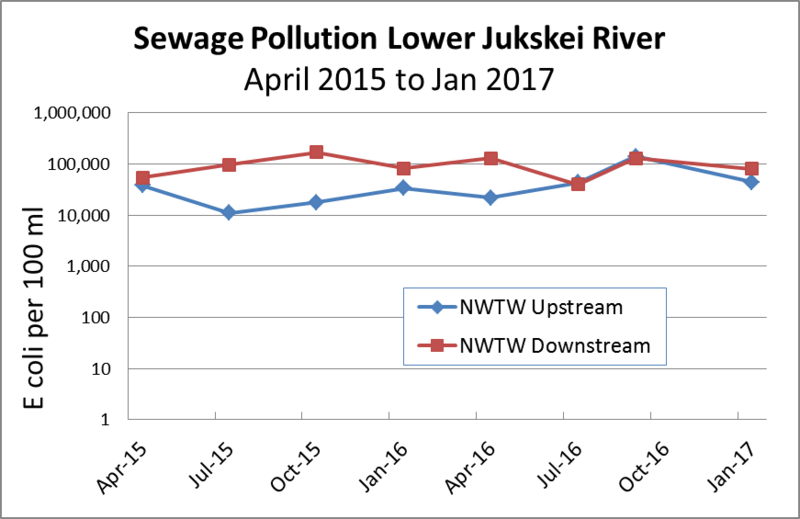 This must have been due to another spill higher up that was fixed about that time. 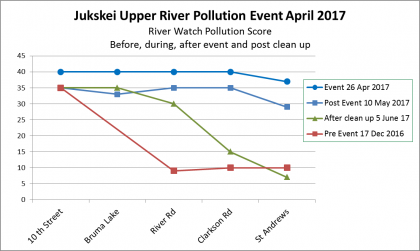 Local residents have told me the clean-up late May eliminated the smell and they are satisfied with the outcome. 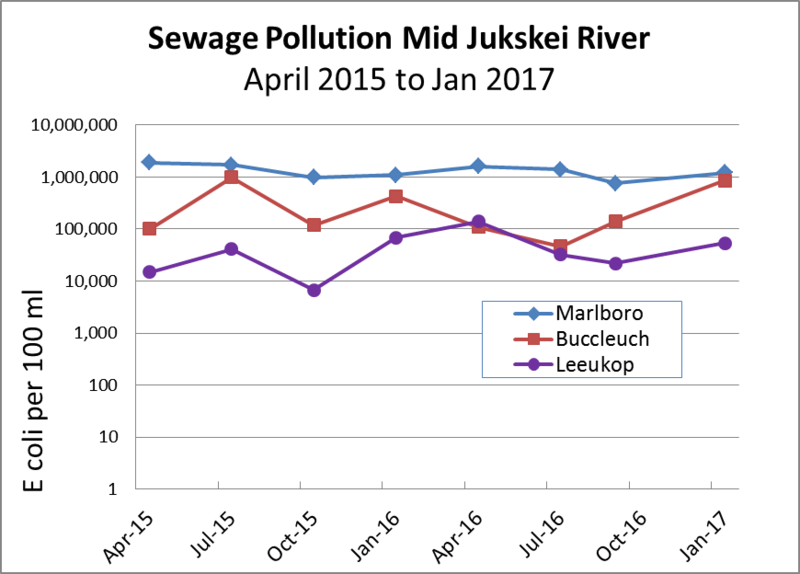 The RiverWatch Pollution Score includes an assessment of the river smells, but these assessments were all done in the morning. 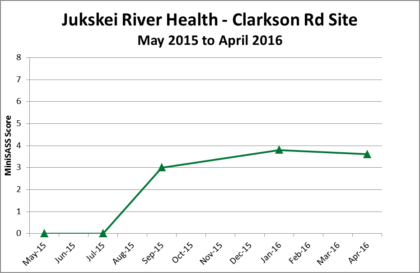 At the two previous assessments in May and December 2016 there was no smell at the Clarkson Rd site. 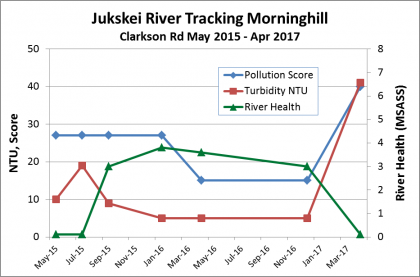 On 5 June 2017 a strong sewage smell was noted at the Turnstone and Bruma sites and faintly at the River Road site, but not at Clarkson Rd and further downstream. 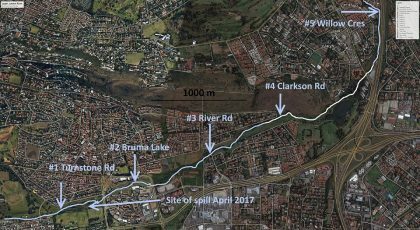 The only improvement to something better than the pre-condition was the elimination of the smell at Clarkson Rd, reported by residents. 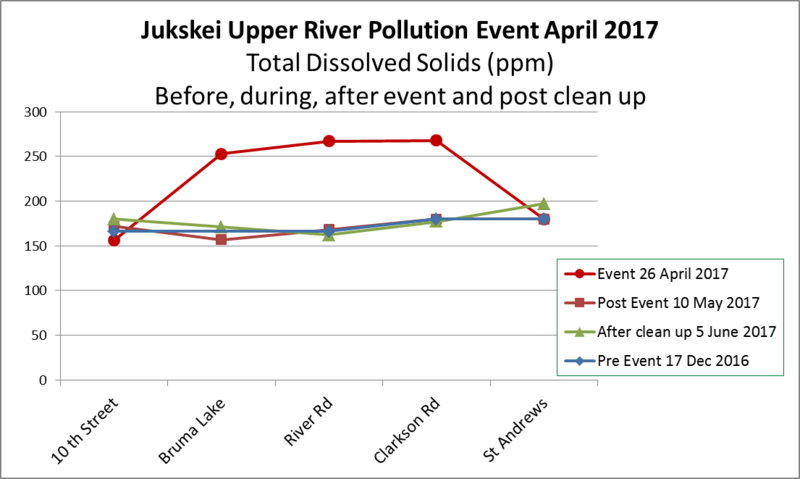 Apart from that all sites as far downstream as Clarkson Rd had improved but not fully returned to the pre-condition. Other factors contributed to the improvement such as the physical cleaning, fixing another sewage leak in Morninghill and the rain two days before the clean-up started. As an experiment to see if treatment of the contaminated river with enzymes and bacteria is effective, it is not possible to draw any conclusion. 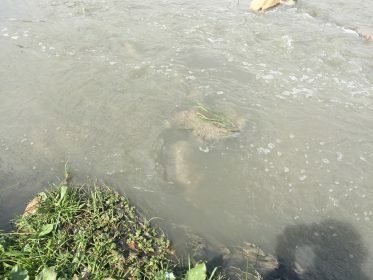 The sites will be tested again late July including the bio-assessment for River Health, which needs six weeks for recovery after a disruptive event. 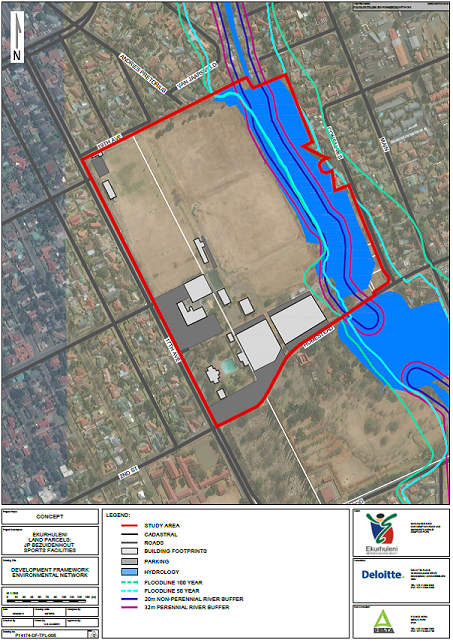 Documents on the proposed development of JP Bezuidenhout Park and Horwood’s Farm show 50-year and 100-year flood lines. 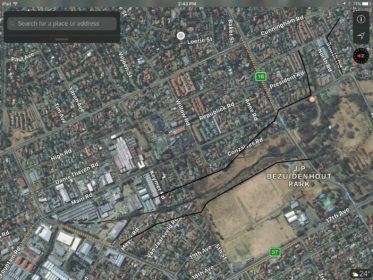 The flood on 9 November 2016 reached and slightly exceeded the 50-year flood line opposite the sports fields. 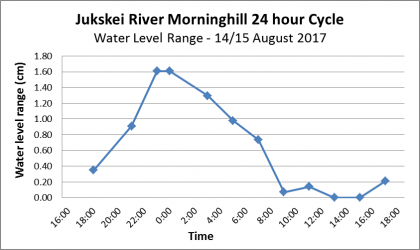 South of where the Harmelia Stream crosses Main Road (just off the map provided so one needs to extrapolate) the flood levels were probably well over the 50-year flood line. This is because the run off from Meadowdale industrial area crossed the R24 Freeway, overflowed the Buurendal retention dam, and flowed directly through Buurendal, Highway Gardens and Hurlyvale suburbs to arrive at this point. 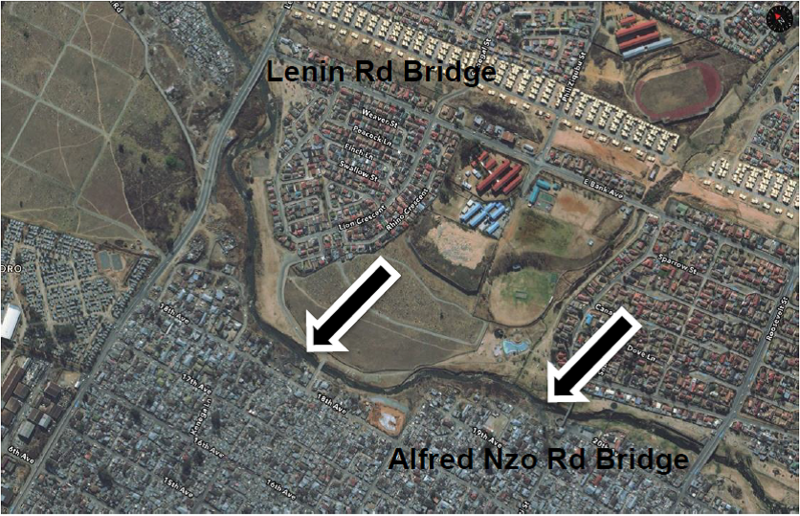 The photo below shows the maximum level of the water in Main Road between North Road and South Road. 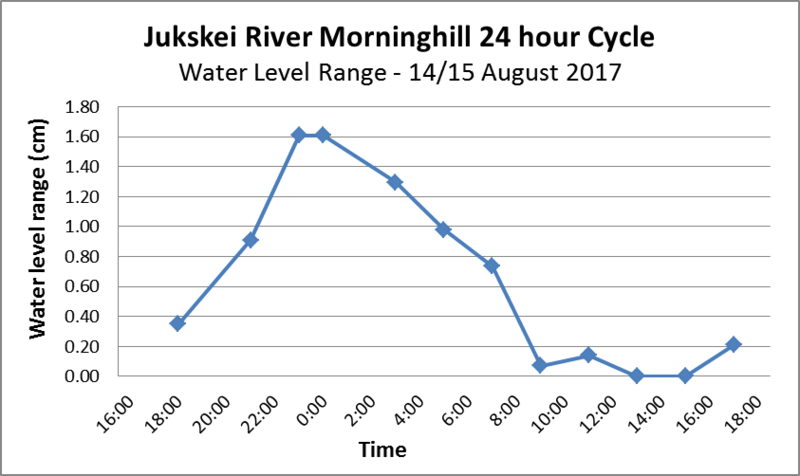 This was mainly due to the flood through the suburbs. 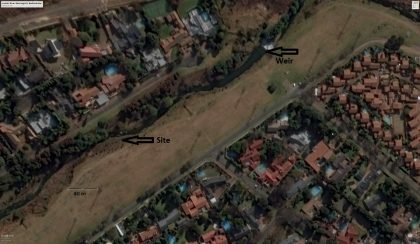 See also Rainfall and Jukskei Rive Catchment Information and Edenvale Stream. 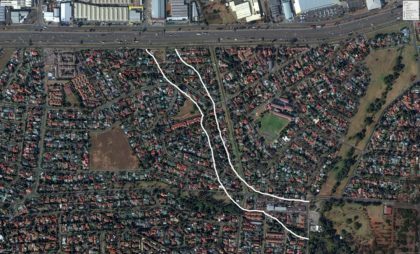 First, the flood lines used in the documents for the proposed development show residential buildings inside the 50-year flood line, while the 100-year flood line includes up to three rows of houses. 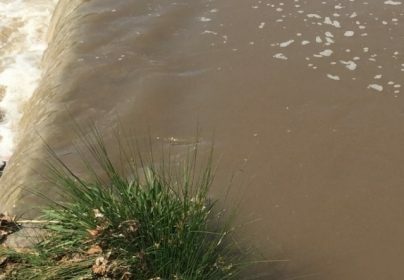 At the time they were built they would have been outside any flood risk area. 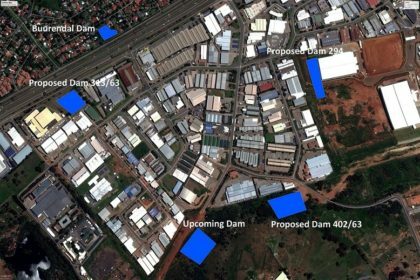 As run off increases the flood lines have to be expanded, and those that were safe are no longer so. Second, the response of the local authority to the increased flooding from the Meadowdale development has in the past been too little too late. 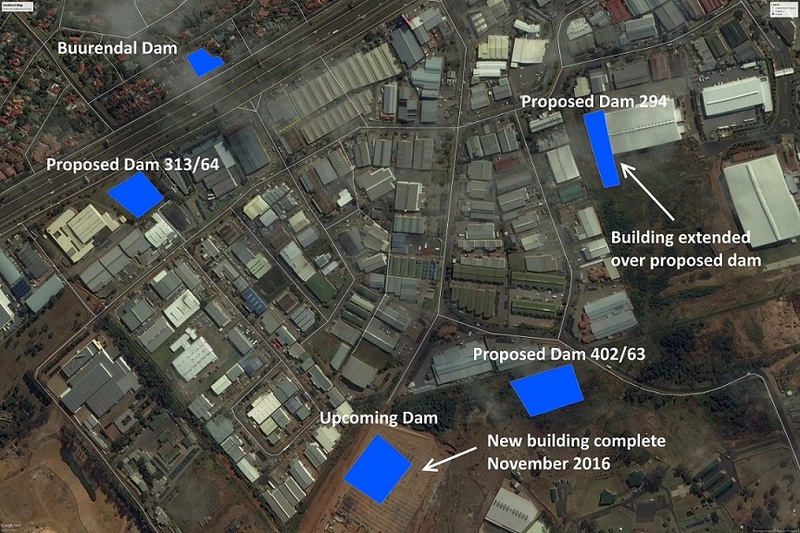 The Buurendal retention dam is completely inadequate. The Eastleigh Stream is too constricted to cope with the current run off and further development in the catchment will make things worse.